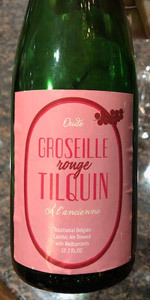 Beer of spontaneous fermentation, the Old Groseille Rouge Tilquin is made from the fermentation of 260 gr of redcurrants by liter of lambic. Unfiltered and unpasteurized, this beer is refermented in the bottle. Ingredients: water, malt, wheat, hops, redcurrants. This one pours a light hazy pinkish color, with a small head, and lots of lacing. This smells like super prickly fruity funk, currants, red wine, oak, yogurt, lactic lemony acid, etc. This is supremely funky, with tons of great red currant flavor, very sour, but with a touch of jamminess. There's a ton of sourness here. It's really complex while remaining very tasty. This is a bit more carbonated than Tilquin has been lately, which is nice. Despite the heavy acidity, it's pretty drinkable. I'm loving all of these new fruited Tilquin beers - they are sneakily basically on the level of Cantillon and 3F. Fantastic. Delicate pink color with a small pinkish head. Aroma was fruity with currants and cherries, along with funk and hay. Taste followed. Lots of funk. Bleu cheese, barnyard, etc but mixed with bright fruity notes. Clean and dry. 375 mL bottle. Pours a pinkish red body. Smells really funky. Cheese and currant. Dried grass. Oak. Really nice nose. Tastes of currant, though not very tart. Strong oak. Cheese turns to yogurt in the finish. Back end has a little bit of a plastic or rubber flavor. It's not strong, but it lingers. I'm being picky, but it's there. Medium body. Smells incredible, tastes really good. Pours an orange-red color with no head at all. Smells heavenly of earthy, unripe redcurrants, together with a well pronounced dose of funk. Old basement leather and wet straw add to a pungent, yet very balanced and complex impression on the nose, building up a great foundation for the prominent fruit in this. Has a lower carbonation, highlighting the lighter body of the beer perfectly well, as this sparkles up during its finish, while leaving enough room on the palate to display the beer‘s complex flavors perfectly. Tastes fruit forward from the very beginning by revealing a wild berry fruitiness, which manages to bring sweet and sour flavors to palate at the same time. Its prickly sweetness gets highlighted by blue cheese, old leather and lots of dried shrooms. Offers a short, sweet peak with more malts adding to the red currants, toned down after the swallow by a mineralic burst, emphasizing the reviving sourness. Finishes heavier on the fruit piths, tart, entangled in moldy wood, finding an earthy balance which creates a great aftertaste. While the beer manages to come along quite unapologetic in terms of its great use of berries, it manages to rely not solely on those. It is extremely versatile and complex, creating an intriguing, well working interplay, which manages to bring up something new after each sip. This is great, looking forward to try the 750ml version. Poured from 12.7oz bottle into glass. Best by date is '21/02/2028'. Cage and cork bottle. Green bottle. Cloudy, orange red rose colored body. No head, but rising bubbles do form a partial ring. No lacing. Aroma of redcurrants, lemon, leather, and horse blanket funk. Taste is sour balanced by the funk. Strong tart redcurrant flavor. Very little aftertaste. End of taste is flat lambic funk. Medium mouth feel, rather dry overall. Good carbonation. Excellent blended lambic, with the tart red fruit, and ending of funk and barrel. Ruby peach color after a nice pop. Grapefruit and citrus. Sour and tart. Lemon acidity. Tilquin house flavor all around. Reminds me of ruby red squirt. Pretty flavorful and much better than I was expecting. 750ml bottle 2017-2018, bottled in March of this year. Plenty of pop when the cork came out, decent carbonation. Smells like currant. Flavor is filled with currants, nostalgic hints of Russian River Consecration, mild lambic funk. Juicy. The liveliness of the fruit is great. Solid fruit lambic. Little head production, and what little foam is produced is soon vanished. Brew is an attractive dark reddish-brown color, and while it appears clear, very little light actually makes it through. Nose leans on must and oak, featuring plenty of tannins, light vinegar, and an unidentifiable berry mash, redolent of cherry, cranberry, and raspberry. There's an almost milky quality to the must. It is immediately more sour on the palate than anticipated, and yet that punch quickly recedes - albeit not completely. There's still plenty of sharp tartness, but it goes from an oaky, vinegary edge to an organic fruitiness, like sour cherry pits and peels. Fruit is not overpowering, and not particularly sweet, allowing for a wonderfully nuanced presentation of the funky depths this brew has to offer: earth, cheese, leather. Fairly dry, but the finish isn't too short, with a nice tangy fruitiness lingering. This is an impressively balanced lambic: not the sourest, not the fruitiest, not the sweetest, and not the funkiest. Yet, it brings all of those together quite impressively, and is more sour than most offerings from Belgium. I think my rating would be a touch higher with just a bit more fruit flavor, but I love the balance of sour and funk. I can only imagine the fruitiness fades somewhat with age, which would likely bring out the funkiness in creative and exciting ways. At over $30 per bottle, that's an experiment few can afford, but I'm quite pleased with this as a one-time purchase. A rose-hued golden pour, nice settling sediment and some frothy bubbles of white head that sit on top. The nose is complex and wonderful, notes of earth, musty white grapes, rosé wine, and undertones of white pepper and bitter currants. Stings the nose slightly with that mildly ammoniated quality , but so pleasant and well-balanced. Tart, sour currants hit you first. Crabapple, green apple, white grapes, and cranberry are all found in these puckering flavors. As it finishes, flavors of lime and grapefruit settle on the tongue, balancing an emergence of hay. Dry, with a nice minerality and consistent tart, puckering quality throughout. A very crisp, clean, lambic. There are some beer styles that trek easily through the crowded beerscape with ease. Never phased by the roasty, the sweet, the bitter or the floral, the gueuze might be time honored, but that doesn't mean that there's never room for change. Gueuzerie Tilquin introduces a redcurrant fueled sour ale for a fresh taste on an old classic. Pale mauve in color, the foggy gaze of Oude Groseille Rouge caps with a dainty short-lived swirl of creme. Earth, pepper, red berry, rose wine, cider and sea air wafts onto the nose with a fresh and earthen bouquet. Early sweetness is remiss of hard candy, taffy and a kiss of sourdough, at least to start. The sweetness might be scant, but a dry wafter character continues to provide tepid support through a middle palate of sourness, succulence an sass. A bold rise of red berries come with notions of cranberry, juniper and strawberry while carrying the currant flavor proudly. Meanwhile a brisk undertow of crabapple, white grape, lime, grapefruit and tart raspberry add a natural acidity with a slightly more robust tone. A light mineral taste brings a briny late palate of damp hay and leather. Dry, crisp, clean and like a fine French rosé, Tilquin simply does no wrong. This tart, tangy and tantalizing ale is effortless enough to drink in quick order, but is revered as much to be best appreciated as a slow sipping affair. A brief afterglow of fruit skins, saddle leather and weathered cork bring the earthiness and fresh fruit back to the center of attention. Hazy salmon with a thin white ring, this old lambic has a skunky almost burnt rubber funk with accents of hay and wildly aged hops as well as tart rhubarb and red berries via a crisp, medium-full body with a chewy dry grapefruity finish. 375ml cork and cage, 2017-2018 vintage, Tilquin tumbler glass. Cork comes out with a big pop, and plenty of carbonation is verified. Cloudy light copper reddish body, one finger white head, fair retention, minimal lacing. Smell is big mildly tart and earthy currant, a bit of raspberry tartness, slightly sweet grain, mild-moderate acetic acidity, big oak, touch of red tannic vinous character, lemon and a good dose of funk. That distinct currant aroma outshines everything else, and that's saying a lot. Flavour is an incredible melange of currant fruity sweetness, lemony tartness, mild-moderate acetic acidity that doesn't strip the enamel off your teeth but nicely supplements the currant and lemon; oak, vinous character, a bit of leathery, dry lemon peel buttressed by even more currant on the finish. Very currant-forward and delicious. Mouthfeel is medium lighter bodied, appropriate for a fruited lambic such as this, good carbonation, slightly slick leathery but otherwise currants on the finish as it warms up. Really nicely executed here by Pierre. Love that there's finally a distributed non-one-off lambic with red currants that is of this quality.